There are four main tourist hotspots in Myanmar: Yangon (formerly Rangoon), Mandalay, Bagan and Inle. 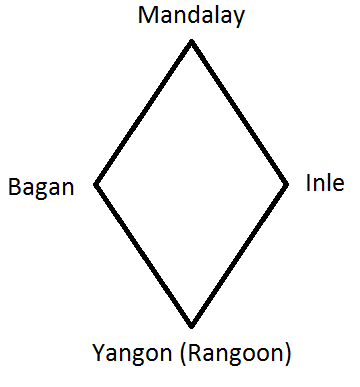 They are located as a diamond shape if you look at a map of Myanmar with Yangon in the south, Mandalay in the north, Bagan in the west and Inle in the east. Along with these there are a few others depending on your route and your preferences. Really, though, if you want to boil it all down, Yangon and especially Mandalay function more as transport hubs and Bagan/Inle are the only real tourist spots. 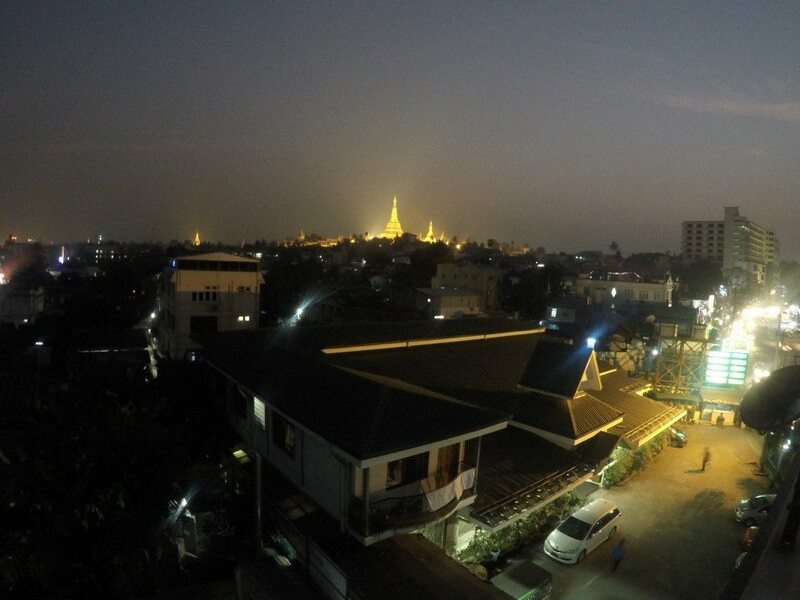 Since Myanmar is not that easy to enter overland, most people are flying to either Mandalay or Yangon. However, as I have made it a point to not fly unless absolutely necessary, I took the overland route which took me through Hpa-An. A stop I would highly recommend even if you are only in Myanmar for a week. The capital, Naypyitaw (since 2006 – it used to be Yangon), is also definitely worth visiting if you want to get off the beaten track. Both cities function as transport hubs even though Yangon is the more common one. Yangon is interesting in the way that it allows no motorbikes in the city center, not even for locals which gives a different feel than the rest of south east asia. It also has a number of interesting temples and locations. It’s a decent and nice town to hang around in for a day or two. One thing you shouldn’t miss is the Shwedagon Pagoda in Yangon which is very impressive! Bear in mind though that you need proper clothes (pants, cover your shoulders etc. ), will need to pay an entrance fee and will have to deal with many many tourists. This is one of the most touristy spots in all of Myanmar but still worth it. Mandalay really has nothing interesting going for it. It’s good if you want a quiet hotel (not hostel) and/or can find a cheap flight ticket here. Other than that it just functions as a bus/train/plane hub to nearby places of more interest. The only thing worth seeing in the city is a very picturesque teak bridge called U Bein Bridge. I personally recommend skipping Mandalay and focus on something more unique and special, namely ALL the rest of Myanmar. Note: I’ve heard from multiple sources (other travellers) that you can no longer climb the temples at night, ie. for sunrise and sunsets. This is a very large part of what makes Bagan unique. This is, however, still Myanmar and I’m sure you can just do it anyway – even if you do get “caught” then a small bribe or simply saying you’re sorry should be enough. Has anyone been there since this change that can confirm/update on this ? Please comment! In short, this is a massive archaeological site boasting an astonishing 2700 (approximately) temples. During it’s prime it was closer to 13000. This doesn’t mean that the area is huge, in fact you can drive from one end to the other on an e-bike in about 30-60 minutes. Without having the exact numbers I’d estimate it to be an area of around 20 * 10 km. The area is surrounded by 3 cities: New Bagan, Old Bagan and Nyang-U. The night-busses arrive in Nyang-U but most of the backpackers go to New Bagan – a taxi ride of about 7000 kyats although they will ask for 15000 from you. in Nyang-U there are cheaper (and worse quality accomodation) and in Old Bagan is where the more upscale accomodation is. 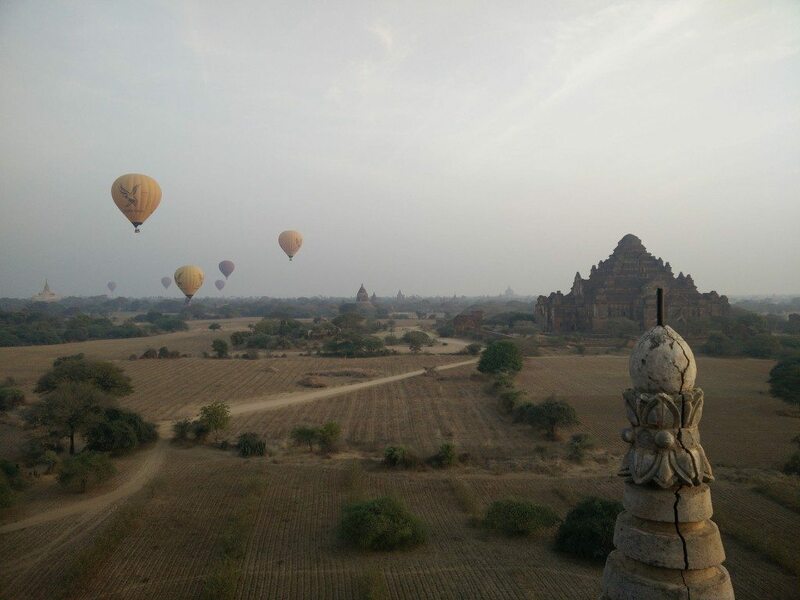 I staid in New Bagan which is quite touristy and expensive but has a good vibe. Lots of backpackers in that area. 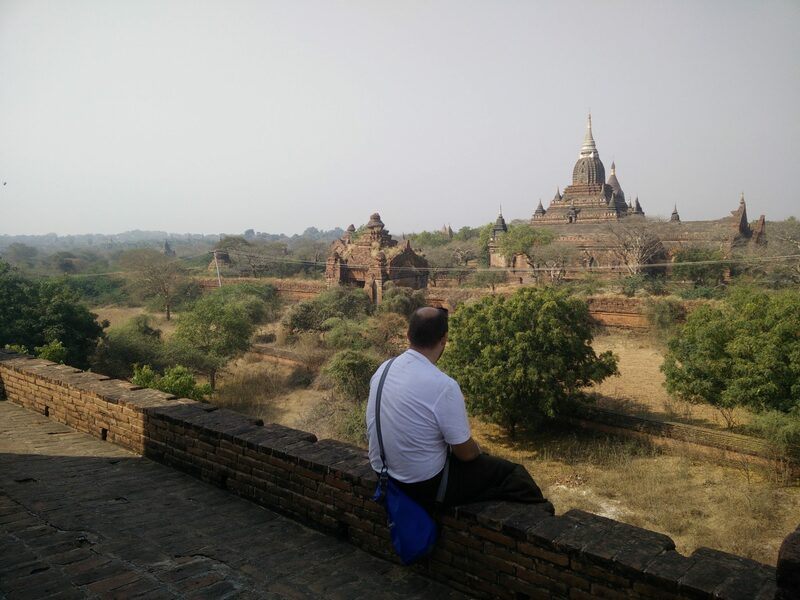 When you get there, rent an e-bike (motorbikes are not rented to foreigners in Bagan) and scoot around the temples. This is basically the whole thing. Go with a group of friends and see the temples or drive around alone and get lost in the land of temples. Find yourself an empty roof and just sit there and contemplate about things in life. There are very few bars in New Bagan and the temple area is the whole thing. But it’s worth it. This area is obscenely picturesque and when you see the sunrise/sunset you will fall in love. At sun-rise about 25 hot air balloons fly every morning, making for some of the most beautiful sunrises you will ever see. 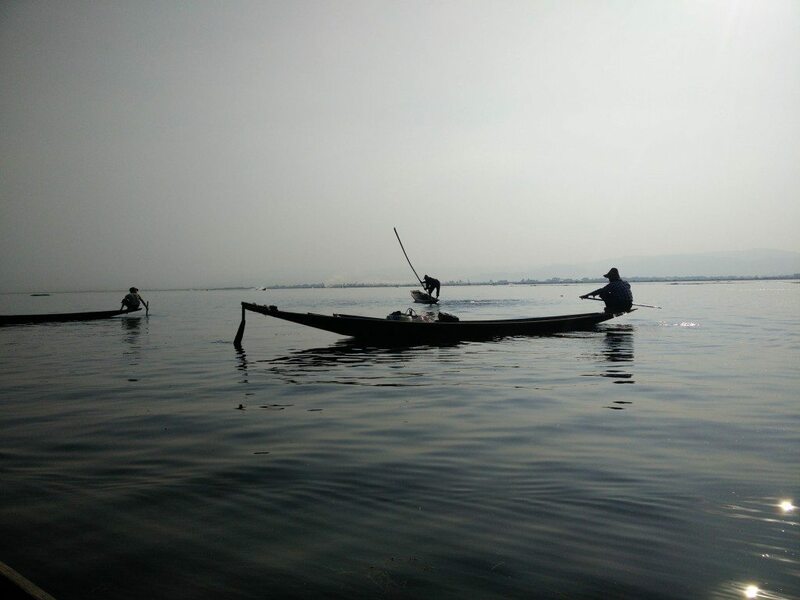 Most of the flashpackers you see out there will do one or two days at Inle Lake. It’s a small city called Nyaungshwe near the lake where everyone stays and it’s from here the tours/trekking starts. The lake is beautiful and there is a reason why everyone goes here but it has become murky and brown even though just a generation ago you could drink from the lake. Motorized boats sailing around tourists add to this but mostly it is due to fishermen and other locals using the same motorized boats and fertilizers used in the floating gardens. You can get a day-tour boat trip from any hostel you stay in taking you to the sights of the lake – the floating gardens, the four tribes living on the lake and the fishermen amongst other things. It makes for a great day and is worth doing. Remember sun-screen! Another day can be spent on a bicycle ride around the monastery’s and caves in the area. For an evening activity visit one of the two vineyards in the area – one is close and has an amazing sunset view but unfortunately lacks good wine – the other has good wine but is further away and requires a tuk-tuk ride or an avid bicycler. If you spend more days in the area, you can go on two or three day hiking tours in the mountains or alternatively hike from Kalaw to Inle Lake instead of taking the bus directly to Inle. Trekking is always a fun activity and the mountains are beautiful – if you are going in the dry season some of the waterfalls along the Kalaw – Inle Lake route will be dried out so maybe a tour along the lake starting and ending in Nyaungshwe is better.